Adam Lambert Backs Into This Year’s Grammy’s! You are here: Home / Tours and Live Performances / 2015 Queenbert / Adam Lambert Backs Into This Year’s Grammy’s! E! Entertainment featured one of Adam Lambert’s most endearing qualities on their pre-Grammy show – his backside! This occurred during a Spin the Wheel game with co-hosts Giuliana Rancic, Brad Goreski, Kelly Osbourne and Ross Matthews. The clip comes full-circle when Giuliana mentions Queen’s Fat Bottom Girls at the end. During the game, the wheel landed on Grammy Got Back. The contestants had to guess from 3 booty photos which one featured a current Grammy nominee. If you couldn’t tell from the audio, Ross Mathews incorrectly guessed “the one on the left!” Every Glambert knows this booty obviously belongs to Adam Lambert! Pop Princess Kelly Osbourne correctly identified the booty in the middle from Miley Cyrus. This game is especially fitting since Adam is laid up in bed with severe bronchitis, causing Queen + Adam Lambert to cancel their show in Brussels tonight. Hopefully this humorous mention will help him with a speedy recovery. We’ll be anxiously waiting for next year’s Grammy’s, hoping Adam will be a nominee for his upcoming album, The Original High. I sure hope he is up for some Grammys next year. He definitely deserves some! He needs to be embraced and recognized for his incredible talent and voice! The reason Adam wasn’t recognized this year is this: He doesn’t have any new music or albums to be nominated for. We all know Trespassing should have been nominated in 2012 or 2013 but his label didn’t send Grammy’s there recommendation they were more interested in Chris Brown getting the Grammy which he did but got caught bribing a Grammy Board member. Board Member was fired but nothing happened to Chris Brown. The Grammy Board hushed this up and once again Brown got what he wanted. Next year is Adam’s year with new album. Also Grammy’s don’t normally nominate Classic Rock Bands or really care about them. This award show is not mainly interested in awarding Hip Hop/Rap and Pop singers. 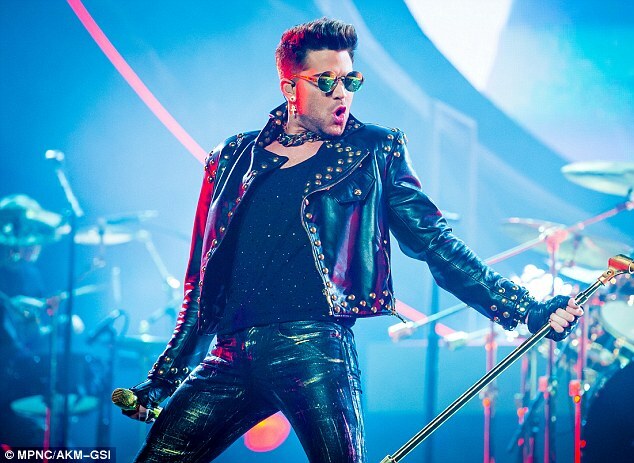 Adam looks so fab in the leather out fit above. He has great fashion taste. And he is so good looking too! And extremely good looking! Love you Adam!